On the 4th (Mon), contemplate the waterfront views at Lake Geneva. For maps, where to stay, traveler tips, and other tourist information, go to the Geneva online travel planner . If you are flying in from Brazil, the closest major airports are Geneva Cointrin International Airport, Bern Belp Airport and Basel Mulhouse Freiburg. In February in Geneva, expect temperatures between 7°C during the day and 0°C at night. Finish your sightseeing early on the 4th (Mon) so you can drive to Annecy. Kick off your visit on the 5th (Tue): don't miss a visit to Pont des Amours, then test your team's savvy at popular escape rooms, then don't miss a visit to La Vieille Ville, and finally explore the activities along Lac d'Annecy. 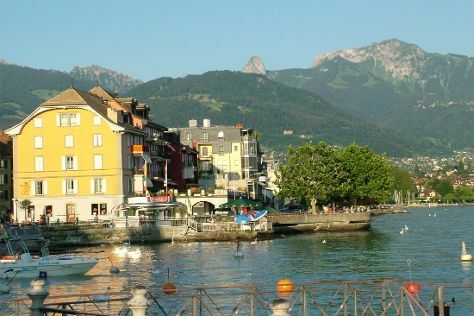 To see where to stay, ratings, and other tourist information, you can read our Annecy road trip planning site . You can drive from Geneva to Annecy in an hour. Alternatively, you can take a bus; or take a train. Expect a daytime high around 9°C in February, and nighttime lows around 0°C. Wrap up your sightseeing on the 5th (Tue) to allow time to drive back home.